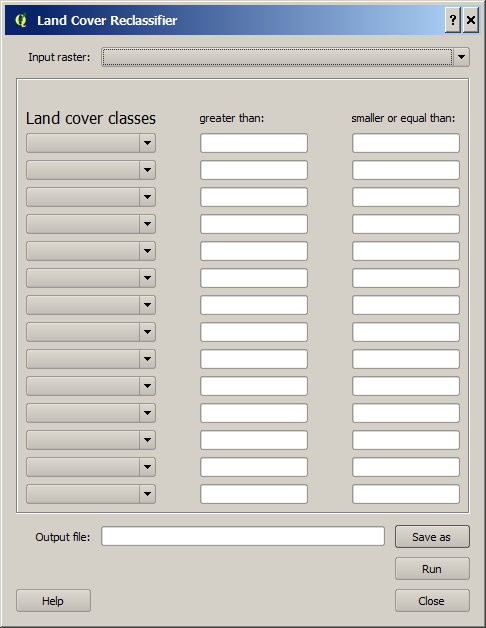 Choose interval values to be classified into a certain UMEP land cover class. Not all lines and boxes need to be filled in, but multiple lines are available in case many different intervals are to be classified as the same land cover class. lower Specify the output file (.tiff) etc. Any valid raster dataset (float or integer) loaded into QGIS will appear in this dropdown list. Choose the one that includes your land cover information. Fill the interval values that you want to reclassify into a certain cover class. All values not included will appear as 0 in the output land cover raster. This should be avoided. Location and filename (geoTIFF) are specified here.